Prominent Milwaukee editor and political activist Rufus King was born in New York City on January 26, 1814. He was the son of Charles King, longtime editor of the New York American, and the grandson of another Rufus King who helped author the United States Constitution. King attended the preparatory academy at Columbia College before entering the West Point Military Academy in 1829. After graduating fourth in his class at the age of nineteen, King served several years in the corps of engineers and then resigned to work as a civil engineer for the New York and Erie Railroad. In 1839, King took a job as associate editor of the Albany Evening Journal under Thurlow Weed. The same year, King received an appointment as adjutant general of the New York militia. King’s first wife, Ellen Eliot, died soon after their marriage in 1836; he then married her younger sister, Susan Eliot in 1843, and the couple had two children. In September 1845, King moved to Milwaukee to assume editorship of the Sentinel and Gazette. He settled at what became known as “King’s Corner,” at Mason and Van Buren streets. King quickly became an energetic participant in Milwaukee’s civic life. Soon after his arrival, he joined a citizen’s committee drafting the city’s first charter. A dedicated Whig, King used the Sentinel and Gazette as a political mouthpiece. His editorials promoted white manhood suffrage, free schools, an elective judiciary, a single district voting system, and state support for internal improvements; he also cautioned against empowering the legislature to borrow money. King was instrumental in crushing the first proposed state constitution in 1846 because it contained certain anti-banking provisions among other things to which he objected. The sole member of his party from Milwaukee elected to the state’s second constitutional convention, he was active in getting this revised version passed in 1848. King also evolved into Milwaukee’s “educational pathfinder.” He advocated free libraries and worked to improve the city’s schools throughout the 1840s and 1850s. He became the first school board president in 1846 and the first superintendent of Milwaukee schools when the position was formalized in 1859. King also served six years on the University of Wisconsin Board of Regents (1848-1854). He was a member of numerous local clubs and societies, as well as the longtime foreman of Fire Engine Company No. 1. In spite of the immense respect the citizenry held for him, as a Whig in a Democratic city he lost mayoral bids in 1847 and 1850. King opposed slavery, joining the Republican Party in the late 1850s. 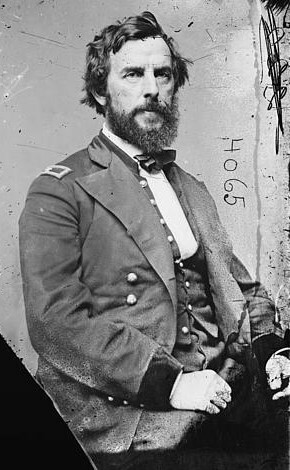 He left an appointment as United States Minister to the Vatican in order to serve in the Civil War, taking command of the “Iron Brigade” of Wisconsin and Indiana volunteers in 1861. After being reprimanded for disobedience and dereliction of duty for retreating in the face of Confederate General Stonewall Jackson’s troops in August of the following year, King held non-combat positions until he resigned his commission in 1863. He returned to his ministerial post and remained in Rome for several years. King subsequently resided in New York until his death on October 13, 1876. ^ Charles King, “Rufus King: Soldier, Editor, and Statesman,” Wisconsin Magazine of History 4, no. 4. (June 1921): 371-373, accessed February 26, 2013. ^ Perry C. Hill, “Rufus King and the Wisconsin Constitution,” Wisconsin Magazine of History 32, no. 4 (June 1949): 418, 421-424. ^ John Gurda, Cream City Chronicles (Madison, WI: The State Historical Society of Wisconsin, 2007), 182-183; Hill, “Rufus King and the Wisconsin Constitution,” 419; Ethan S. Rafuse, “King, Rufus,” American National Biography Online, accessed March 20, 2013. ^ Rafuse, “King, Rufus,” American National Biography Online, accessed March 20, 2013. Hill, Perry C. “Rufus King and the Wisconsin Constitution.” Wisconsin Magazine of History 32 no. 4. (June 1949): 416-435, accessed February 26, 2013. King, Charles. “Rufus King: Soldier, Editor, and Statesman.” Wisconsin Magazine of History 4 no. 4. (June 1921): 371-381, accessed February 26, 2013.